Gutter Cleaning Edinburgh – looking for clean gutters and a reliable cleaning service? Helping Edinburgh and Lothian clients since 2010. If you are looking to have your Gutters Cleaned in Edinburgh and Scotland we can help you. 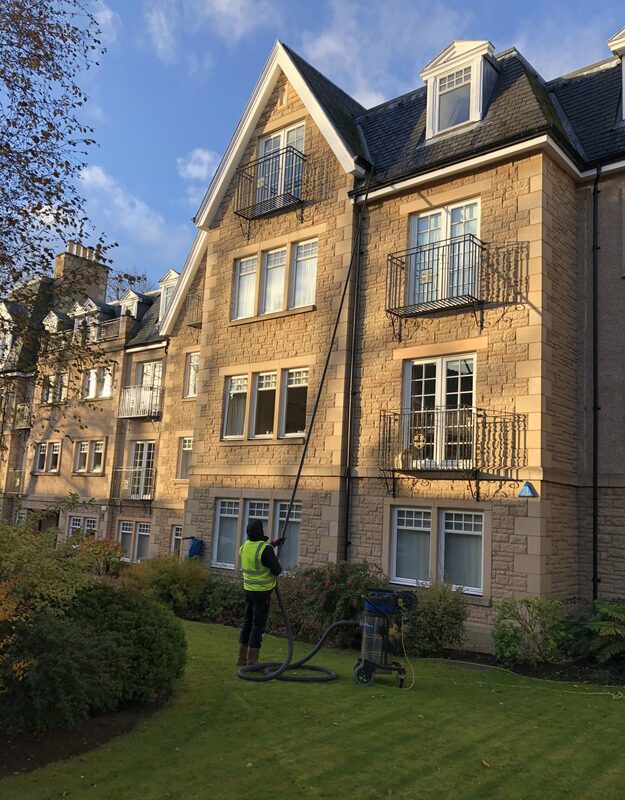 Welcome to Gutter Cleaning Edinburgh as part of ECO Pressure Clean an Edinburgh based environmentally ethical cleaning company, we bring an alternative way to clean and maintain gutters. Started in 2010 we have the experience and equipment to tackle small and large jobs. View a video of the system below. We have invested in the latest gutter cleaning technology using high-pressure vacuum portable equipment called SkyVac. Think of hoovering stairs and you have the start of the system but there are 3 powerful motors and a carbon fibre pole system that builds up quickly from 1 to 4 floors. We are the first company in Scotland to use this commercial system. This state-of-the-art system is quick, safe and reliable. It can also clean inside the top of the downpipe and check if it is flowing properly. The Skyvac system can work up to 4 floors high or around 10m high. It provides many benefits as we do not usually need ladders, scaffolding or powered access to perform either a survey or the actual cleaning. So its quicker, simpler and less expensive for you! We won’t need to walk all over your roof either. So its simple quick and safe. Gutters perform a simple but vital task – they move rainwater from the rooftop to the ground, preventing dripping, pooling and water entering your property where it will cause damp and damage. Leaking water will damage walls, it rots wooden items such as window frames and will cause unsightly stains on your walls. Many property owners find it difficult to perform regular cleaning due to the height and safety aspects. Gutters like most things need regular maintenance, most need cleaned annually or every other year. We usually schedule gutter cleaning to happen once the leaves have blown off the trees. The majority of leaves get blown onto rooftops and end up in your gutters. Its simple to remove them and regular cleaning helps to prevent big expensive problems, blocked downpipes and floods. We can help just get in touch to get a free quotation and survey. Contact us for gutter cleaning in Midlothian, Edinburgh and East Lothian.